A friend and I went to Latin Sandwich Cafe last weekend. My friend is Chilean and so are the husband and wife owners, Eddy and Orietta Quijada. 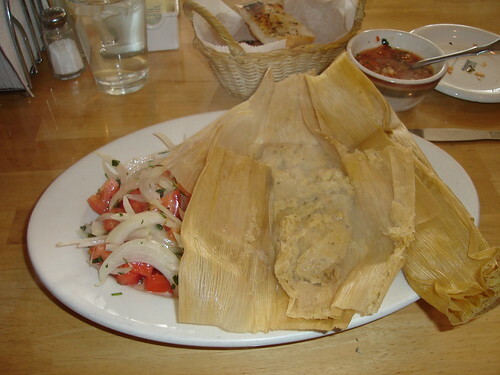 The LSC website claims it is the only Chilean restaurant in the City of Chicago. In fact, we went to scout the location for an LTH event dinner with Chilean theme. LSC is also BYOB. Chile, Chilean red wine, a little Tango music. oh, I get it now. My friend wanted me to try some of the dishes from her homeland, the most well known, of course, are the empanadas (website also calls LSC the House of Empanadas). Empanadas are stuffed pastry-like dough that is either baked (Empanadas de Horno) or deep fried (Empanadas Fritas). The traditional filling includes onion, olives, hard boiled egg, raisins and a type of meat or cheese. My friend also worked at the Bucktown Empanadas themed restaurant when she first came to the U.S.
We had the ground beef and chicken empanadas with the traditional stuffing. We also had ham and cheese that only had ham and cheese. We rounded this out with Queso Empanadas Fritas (fried cheese empanadas). These were all quite delicious, but I gave higher marks to the ground beef with traditional stuffing and the fried cheese all by itself, which was like eating a fried cheese curd the size of a small fist. (I'm from Wisconsin, what did you expect my point of reference to be?). The cheese was salty and gooey and a great counterpoint to the crunchy, crispy deep fried crust. The empanadas are accompanied by a sauce called pebre, which is very much like pico de gallo. We also had Chilean salad with our empanadas, which consisted of tomatoes, onions, parsley and a light olive(?) oil dressing. I would have liked to try a few more things, but after Irish oatmeal for breakfast, Middle Eastern Bakery meat and eggplant pies and falafels for brunch and Chinese dim sum at Happy Chef for lunch, my poor tummy was about to erupt into WWIII, or at least a heated UN debate. The LSC menu covers quite a range of South and Central American and Carribe fare, including Mexican, Chilean, Cuban and Puerto Rican. I am sure most people (as I would have) would mistake it for just another store front Mexican joint. I could have killed them, but chose to sheepishly wallow in humiliation for my fellow countrymen. Orietta just happens to be running a business during the day, tending to the needs of her family, going to college at night and a speaks fluent English. Oh, let's be generous to those fellows'about eighteen GED's higher in educational equivalency than those two put together. I can't say the same for the guy who prints their menu's, but I do like the fact that one category is called Sandwishes-as a matter of fact, I wishes I had me one right now. For those who have been to Latin Sandwich Cafe before and were turned off, a repeat visit may be in order. Eric and Orietta only took over the place about 2 years ago. At least according to my Chilean friend, the food is vastly improved over the previous absentee owner. My friend particularly raved about their Pan Amsado (home bread), I didn't find it had much flavor, but then some of the things I hungered for when traveling abroad were plain and simple home cooked items. I will go back for the empanadas, but I would also like to give the menu further exploration. Perhaps we will have a BYOB event planned there soon. I know one guy who may show up just because they have tater tots on the menu. You know that we had a dinner there long long ago, right? Not that that means we couldn't again, if things have changed. It was one of those places that I ate at so many times in preparation for the dinner that I didn't really have an urge to eat at again for a long time. Guess it's time to. I'm glad you enjoyed it. That gives me hope. For my one and only visit after the new owners took over, I was completely ignored for over 10 minutes. No hello, no "we'll be with you in a minute"...just ignored. I walked out feeling very dissapointed (and somewhat discriminated against, being non lationo) that this promising looking place turned out to be so bogus. Yes, about 18 months ago. I brought Maria Kijac, who wrote South American Table, to dine with us. They were making humitas, or something like it, using basil to dim the sweetness of our local sweet corn. Maria went into instant consultation mode suggesting they use cheaper corn meal rather than expensive basil to dim this sweetness. This humita had a too soft, almost liquid, texture and relatively expensive $4 each because they were hard to handle. While waiting for the appointed meeting time, we discovered the Ecuadorian bakery across Elston AVenue with their storefront on Irving Park roasts whole pigs on weekends. Yourpalwill commented that was the good find because for the $5 or $6 you get a wonderful roast pig meal with cracking, something like hominy and pico de gallo in a lettuce cup. I've never returned to the Chilean place, though I did go once to the Ecuadorian bakery. My family was out of town, so I played Chicago Chowhound for a weekend. Last edited by Cathy2 on February 17th, 2005, 7:36 pm, edited 1 time in total. Regardless, let's go again. Perhaps the Thirsty Third Thursday group will have a BYO event there. FYI, the March event is moved to the fourth Thursday out of respect for thirsty Irishmen. I can't remember if there were big post followups. (Whoops, I see Cathy linked to it, I read "Pics" not "post" the first time through.) I expect there were but the CH search function turned up the pre, not the post, so I linked to that. Again, don't mean to say that folks shouldn't check it out again, since the logic that "it seems to be the only Chilean restaurant in town" remains as valid today as it was a couple of years ago, and needless to say, many many people did not attend. The other thing I love about this place is the people. On two consecutive Sunday visits, I met the owner and at least seven other family members, who all seemed to be working busily and happily, with the owner's wife and daughter seeming mostly in charge of the kitchen and most importantly the breads. They are very delightful people, and the owner Nelson Sosa, showed me his CD of Latin music, which he apparently plays at various locales around town. From your description, it sounds as though this restaurant is still being run by the same folks as when we went, though perhaps patriarch Sosa is there less often than before. Prior to their taking over two years ago, it was a generic Mexican place called El Torero, with no hint of Chilean food. It's funny how moving a mile and a half north in such a dense city really takes someplace off your radar that you formerly frequented. I don't believe I've returned since the Chilean dinner. My recollection is that I rather like the beef empanadas and the homemade breads, and I can do without the cold vegetable torte. Eddy and Orietta are listed as the owners on a business card. As Shep Proudfoot in Fargo mights say, I don't know nothing about Nelson Sosa, don't vouch for him. I didn't realize you had an organized dinner there, much less talked with and knew the owners. I was told that the guy who ran it before was trying to run a real estate business and a restaurant at the same time. I have know idea if this is Mr. Sosa, or if Mr. Sosa is related to the current owners. I will be back next time I am in the neighborhood....I thought the empanadas almost destination worthy, but at least neighborhood choice worthy. Some friends just moved into the neighborhood near the Latin Sandwich Cafe and they recommended that we give it a try. More specifically, they recommened the Lukas Sandwich, a combination of ham, cheese, and avocado that was suggested to them by owner's son, who evidently gave his name to this particular item. We went out on a warm Sunday evening and found the place very quiet at around 6 p.m. (early even for our dinner). We ordered just one cheese empanada, which was unusually nice. My spouse has remarked before on the variety of things that appear under the name "empanada" (and just two nights ago, we had beef empanadas at Zocalo), and the menu at LSC has Chilean and Caribbean categories, so I'm not sure what variety of empanada this was. The pastry was very thin and crisp, and it had been filled with mild, chewy cheese and deep-fried to a pale gold. With that, we had what they called a Chilean salad of tomatoes, onions, and cilantro, and it was delicious. Our dinners consisted of two sandwiches: one Churrasco Completo, perfectly grilled steak with lettuce, tomato and pickle on a fresh, tender bun; and one Jibarito: grilled steak with lettuce, tomato, and fried onion served between crispy sheets of fried green banana (which served as the bun -- there was no bread involved). The banana was mild and crunchy, without any strong banana flavor, and once again the meat was perfect, flavorfull and juicy. We skipped desert and instead each had a cortado. They were not strong, but not bitter either. Just very nice little cups of mild coffee. The service was warm and friendly, so we felt very well taken care of. I wish this place were a little closer, because I would love to go back again soon. Stopped for lunch at Latin Sandwich Cafe, hadn't been in well over a year and quite enjoyed a tasty and reasonably priced ($5.99) lunch of lightly fried Merluza and Chilean salad. Mild, moist, white fleshed Merluza, which a bit of web surfing indicates is Hake, was served piping hot and came with a choice of rice, potato or salad and a soda, I opted for salad, a refreshing mix of tomato, cucumber and cilantro. Small rounds of forgettable bread initially elicited a ~shrug~, but when topped with a scant spoon of vivid house-made Pebre, a medium spicy Chilean table salsa, piqued my interest, as my soon empty basket indicated. Friendly efficient service, comfortable seating and early afternoon sunlight combined for a pleasant mid day meal. MariaTheresa wrote: they recommened the Lukas Sandwich, a combination of ham, cheese, and avocado that was suggested to them by owner's son, who evidently gave his name to this particular item. Well, they must have named their sandwich after their son, but in Chile a "Barros Luco" is a beef and cheese sandwich, named for Ramón Barros Luco, and a variation of a "Barros Jarpa," a ham and cheese sandwich, named for his cousin, Ernesto Barros Jarpa. Neither one is traditionally served with avocado on it in Chile, nor for that matter any condiment, which makes them too dry for my taste. Mayo con todo, that's my motto, y palta también, si es posible. Living 5 minutes away from LSC, I passed it all the time always wanting to go in. A friend of mine went and didn't enjoy it. Not one to let other people sway my decisions, I went anyway. My boyfriend and I arrived around 2pm to an empty restaurant. He had the Cuban Steak sandwich, I had the Cuban Sandwich, we had a side of rice and a beef empanada. The waitress was really nice. The chips were stale. I was hoping that the food would not follow the same path as the chips. Empanada was pretty good. But our sandwiches were.... okay... the rice... soggy & over cooked. The thing is, as soon as she placed it down, I could tell it was overcooked, so why couldn't they. I really like places like this and like what they are trying to do, and it adds some variety to the neighborhood. I'm going to give it a few more months until I go back, maybe lunch time just wasn't the right time. I used to be a regular at LSC, but it had been many months since my last visit. 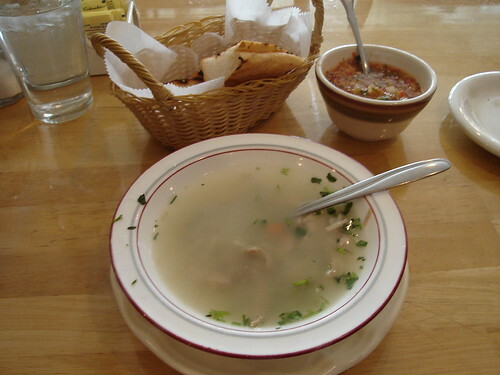 Today's lunch of sopa de pollo and fresh made humitas was as outstanding as ever. The chicken soup is nothing earth shattering: just homemade, not-too-salty, chicken-ny broth with homestyle cut vegetables and plenty of fresh herbs. Simple and very satisfying on a cold winter day. I've been fortunate enough to visit the kitchen a few times, so I know that the humitas are made from corn that is ground fresh daily and mixed with finely diced onions, herbs and spices. This, like everything at LSC, is real, homemade food. In the summer, when the chef hand-grinds fresh, local corn, the humitas can be to-die-for good. Even this time of year, the freshness shines through, and this is a quite satisfying dish. Even the off-season tomatoes in the accompanying chilean salad are evidence of caring owners. They've been carefully selected for ripeness, and the cardinal sin of storing tomatoes in the icebox has been avoided. These are good tomatoes for late January. Last edited by Kennyz on January 24th, 2008, 5:32 am, edited 2 times in total. Oh, I don't know about that, they look pretty darn good to me. I guess I need to branch out from the sandwiches on the menu. We had a late lunch today at Rapa-Nui Restaurant, which used to be the Latin Sandwich Cafe. The name comes from the native name for Easter Island, which is about 2,200 miles west of the coast of Chile and governed by Chile since 1888. Same owners as previously keeping many of the same menu items. There seem to be more dinner items than previously, though. Decor now has a bunch of Easter Island and Polynesian or tiki details. A sign in the window advertises live music on Friday evenings starting at 8:00 pm. We both had the pernil con palta sandwich (pork leg, avocado and mayonnaise on house-made bread) that seemed unchanged. The fresh juices are made to order and come in a pretty large glass. We got one mango juice with two straws. The mango juice was thick, made from well-ripened mangoes and a bargain at $2.75. This may seem like a pretty small lunch to many LTHers but was quite adequate for us and meant that we were not hungry when we moved up Elston to Tony's for grocery shopping. The subname La Casa de las Empanadas still seemed apt with multiple filling choices for both fried and baked empanadas. One gentlemen had a large plateful for carryout while a woman placed a sizable order to pick up around noon on Saturday. The carryout menu lists a web site that does not seem to be active. Is it the same owners? rlguffman wrote: Is it the same owners? Yes, as ekreider indicated in his post above, same owners and pretty much the same menu. Just a new name. I've had a couple of recent meals that I've enjoyed as much as ever. Had my inaugural visit here this evening with Favorite Dining Companion and a friend. Our friend and I each had the Pastel de Choclo. It was quite tasty, but a bit skimpy on the vegetables. A pleasant respite from the crappy weather outside. FDC had the Lomo Encebollado which she reluctantly shared a morsel with me. Excellent homemade bread and salsa. Service was quick and friendly. We were the only ones in the place. Rapa Nui had a for sale sign in the window a month or so ago. Today the windows are papered over with a large coming soon sign for Riviera Maya, Mexican food.